Apple will purportedly unveil a major overhaul to its iPad Pro range sometime later this month. According to the latest whispers from the supply chain, the refresh will forgo the Touch ID fingerprint reader in favour of Face ID and slimmer bezels. But perhaps the biggest change plotted for the new iPad Pro will be the port used to charge and sync the device. Yes, six years after introducing the Lightning connector as the new standard for all iOS devices, Apple is purportedly ditching the port in favour of USB-C and causing everyone a cable-based headache all over again. Rumours of a move away from Lightning come courtesy of iOS software developer Guilherme Rambo, who unearthed a slew of references to the USB Type-C port hidden inside the latest iOS 12.1 beta. For those who haven't upgraded to the new 12-inch MacBook or MacBook Pros, you might not have the latest USB-C accessories to hand. If the latest report is true, it could mean a painful upgrade from all those existing Lighting-based accessories. According to Rambo, Apple will introduce a new panel in the Settings app which will allow iPad Pro owners to control resolution, HDR, brightness and other options for connected external displays. None of these settings currently exist in iOS. Elsewhere, the refreshed iPad Pros will ditch the iconic circular Touch ID home button to squeeze a new edge-to-edge display design, similar to the newest iPhones. However, unlike the iPhone XS, the iPad Pro will not include a notch. Apple has purportedly managed to tweak its Face ID system to work in portrait and landscape orientations – something not currently possible with the iPhone. However, Face ID is still unable to recognise your mug when the iPad is held upside-down. 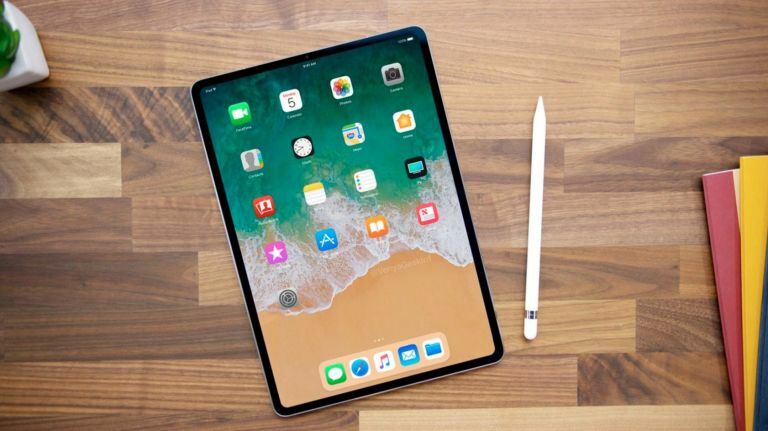 We've not heard anything to suggest the new iPad Pro tablets will deviate from the 10.5-inch and 12.9-inch sizes available on the existing models. However, Apple did decide to squeeze a larger display into the same physical footprint when it shaved the bezels on the iPhone range, so it's possible it will try a similar trick with the iPad. According to Rambo, a new version of the Apple Pencil with AirPods-style proximity-based pairing will also launch with the updated iPads. One of the references unearthed in the iOS 12.1 beta referred to an as-yet unannounced device labelled "iPad2018Fall device", which seems to suggest an official reveal from Apple can't be too far off. From time to time, Apple will hold a hardware event in October to update its iPad and MacBook line.